These irresistible honey creams feature pure honey from a small Pennsylvania apiary. Karen Mosholder's small-batch honey spreads go straight for the appeal of nostalgic treats like pancakes and hot chocolate, but she hopes her honey itself never becomes a bygone ingredient. She was inspired to become a honey producer by the need to nurture bees, precious pollinators essential to our food supply. 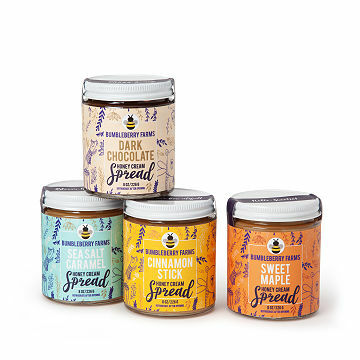 Her set of four irresistible honey creams features pure honey from her Laurel Highland, Pennsylvania bees paired with fresh, honest ingredients like whole milk, butter, and organic spices. The Squirrel Crazy flavor is infused with pure Pennsylvania maple syrup for a classic pancake breakfast taste. Inspired by home baking, Sticky Buns features organic cinnamon. Lover's Leap is an indulgent jar of sea salt caramel that's easy to crush on. Molten Lava is a spoonable rendition of comforting, spiced hot chocolate. Spread them on toast, drizzle them over popcorn or pancakes, add them to your morning coffee, or just grab a spoon and dive in. The set of four, five-ounce jars comes in a box printed with playful bee and honey trivia, like the fact that honeybees communicate by dancing. No word on whether they prefer hip hop or hive music. Karen Mosholder's biggest inspiration is actually pretty small: her industrious honeybees. "I’d read an article in the Pittsburgh Post Gazette about ‘Burgh Bees, Pittsburgh-based beekeeper’s association," Karen recalls. "[They were] trying to encourage people to take a class, learn the craft, and tend a couple of hives—all in an effort to build the diminishing honeybee population." Karen took the course, bought a couple of colonies, and has been hooked on the busy little buzzers ever since. Her honey operation, located in the foothills of Pennsylvania’s Laurel Mountains, crafts honey cream spreads by hand in small batches. I gave this to my parents for Christmas last year. They loved it so much I am giving it to them this year. The chocolate was gone in a couple of days. Really versatile - my wife used them on toast and pancakes. Great in coffee or on ice cream. I stir mine in my morning oatmeal. Only down side - wish they'd last longer! Honey bees and Bumbleberry Farms have put irresistible goodness in a jar!